Schedule strength means a lot when it comes to deciding who earns a postseason berth in the NFL. An easy schedule didn't hand Tennessee a playoff spot last season, but it was a big reason the Titans went 9-7 despite rating as a below-average team by Football Outsiders' DVOA ratings. On the other hand, difficult schedules helped keep Green Bay and Washington at 7-9 instead of making them wild-card contenders. So it's important to know which teams will get a schedule boost in 2018. 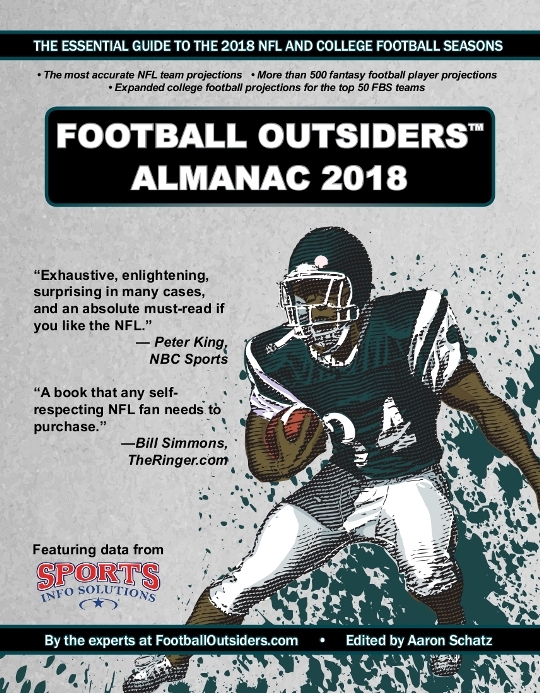 Football Outsiders' annual almanac is currently on sale in both PDF and book form. For more information on the book, along with a link to buy it, click here. Of course, it's tough to project schedules when we don't know how good teams will be in the future. We've done it here using our projections of Football Outsiders' DVOA ratings, which account for general statistical trends and specific personnel changes. The numbers here come from an updated set of projections as of Sept. 5 that account for preseason injuries and suspensions, plus that big Oakland-Chicago trade involving Khalil Mack. Of course, the strongest projected schedule for 2018 is only about half as strong as the hardest schedule from 2017, because our team projections are naturally conservative. Going into a new season, no team is guaranteed to be as good as last year's best team or as bad as last year's worst team. No, not even if that team is starting Nathan Peterman at quarterback. The good news for the Panthers is that the difficulty of their schedule is fairly evenly distributed. An early trip to Atlanta is followed by a home game against Cincinnati. They have four road games out of five in Weeks 10-14, but as of now, those seem like their weaker opponents (including Tampa Bay and Cleveland). And they finish up by going Saints-Falcons-Saints, but two of those three games are at home.